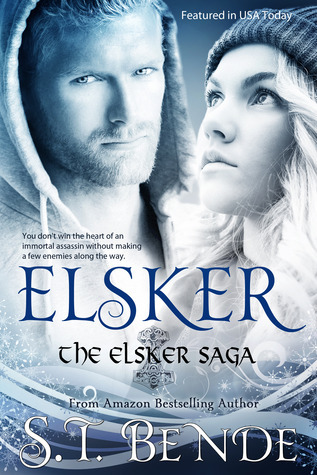 Elsker (The Elsker saga #1) is an upper Young Adult/New Adult paranormal romance story by S.T. Bende. I’m happy to have come across this series. I like a paranormal story as long as it is believable and I liked that I read about other things than vampires, werewolves and elves. Kristia Tostenson prefers Earl Grey to Grey Goose and book clubs to nightclubs. But when she transfers from her one-stoplight Oregon town to Cardiff University in Wales, she falls in love with Ull Myhr. Her new boyfriend isn’t exactly what she was expecting. His cashmere sweaters and old world charm mask a warrior who’s spent an eternity fighting for his very existence. Ull is an honest-to-goodness Norse god — an immortal assassin fated to die at Ragnarok, the battle destined to destroy Asgard and Earth. On top of being marked for death, Asgardian law prohibits Ull from tying his fate to a mortal. No matter what she feels for Ull, Kristia knows she’s the one thing he can never have. It was a very enjoyable story. I was in Kristia’s world just a few pages into the book. That’s something I really value in a story, that it doesn’t take chapters of reading to ease into it. I also really like S.T. Bende ‘s writing style; very realistic conversations and a nice way of describing things without it being too descriptive or long winded. But I have to say the word ‘criminy’ caught my eye. I did not really know that word, but I’m sure that is because English isn’t my first language. And I looked it up, it is only uses six times throughout the book. So I guess it really was me lol. I also like how there is a lot of mythology in the book and how easy it was to differentiate Kristia’s visions from what is really happening by the use of italic lettering. That may sound a bit weird, but I’ve read a few books in which that was kind of hard to figure out which was which. The pace in the story/plot was ok, but I have to note that Kristia might have thought about a few things a little bit better. She accepts Ull’s identity pretty easily, just like she makes the decision to leave her life on Earth behind like it’s nothing. What about her family and her friends? Doesn’t she have to come up with some sort of plan, or at least think about what she is going to tell them when she won’t be arround as often? Another thing I was missing was a bit of action, but that wasn’t really bothering me. I have a feeling we will get to that in the second book in the series. I’m looking forward to reading the rest of the Elsker Saga.